What a whirlwind of activity these past few days have been. Christmas is always more enjoyable when it’s followed by a weekend as we can enjoy our families longer. Today we all find ourselves back to work unwinding after the Christmas rush and most of us are talking to our coworkers about our unexpected surprises, the parties we went to and gifts shared among family and friends. Christmas is such a magical time; one that combines the spiritual meaning of Christmas with the unique ability to bring families closer together and even turn a scrooge into a Santa. Now that the big day has past, it certainly is not the last day for gifting as Christmas is not just based on one day but a season which normally concludes on or about New Year’s Day. Upon occasion many of us have found ourselves in the precarious position of receiving a gift without having one to return with. As embarrassing as this is, just remember that it happens to a lot of us. Don’t fret over these little matters; we’d love to assist you with selecting the perfect holiday gift basket and sending it to them right away. Food gifts are the gift that the recipients truly enjoy and also one that fits everyone’s budget as well. BisketBaskets.com still offers holiday gift baskets for your last minute gifting needs. BisketBaskets.com gourmet gift baskets are always designed fresh after your order is placed ensuring you we deliver only the freshest gift available! All of us here at Bisket Baskets would like to extend our sincere thanks for making this an outstanding holiday season even in this down economy. Bisket Baskets has been providing award winning gifts and customer service for over 10 years and we look forward to serving you for many more years to come. Become a Facebook Fan today and look for upcoming Facebook Fan only specials for Valentine’s Day and you can also find us on Twitter too with Twitter specials as well! Less Than One Week Till Christmas! You’ve waited till the last minute – now what do you do? Completing you holiday shopping list is always tough, especially when it comes to doing it on time. If you’re coming down to the last chance to shop, don’t worry, you won’t have to stress over finding the perfect gift. So make your list and check it twice. If you’ve forgotten about any last minute gifts, don’t panic. BisketBaskets.com is here to help you get all of your holiday shopping done just in time. 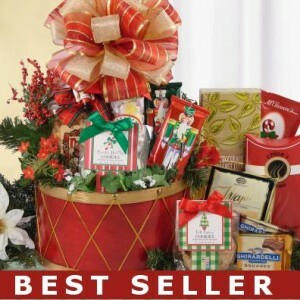 Whether you accidentally skipped over Aunt Susan or couldn’t find the time to shop for your Secret Santa exchange at work, BisketBaskets.com has you covered with a great selection of Last Minute Christmas Gift Baskets that are perfect for spreading the holiday cheer – without you having to break a sweat at the last moment. Filled to the brim with gourmet treats and delights, these Christmas Gift Baskets are simple must-haves for completing your holiday shopping list. Don’t worry – we’re here to help you get it all done just in time. Order now and get your holiday shopping done once and for all. Just don’t forget – check that list twice! It’s all coming down to the last two weekends before Christmas and many of us out there are still shopping for that “something perfect” for people on your shopping list. Finish up your holiday shopping easily with BisketBaskets.com as we have great gifts for everyone young and old! When was the last time you received a beautiful arrangement of flowers? Do you remember the feeling it gave you, the big smile, the warming of the heart and you still hadn’t opened the card yet to see who remembered your birthday, anniversary or even last Christmas? You too can send those warm fuzzy feelings with a beautiful holiday floral arrangement from BisketBaskets.com. Our fresh cut Christmas flowers come directly from the grower beautifully arranged and shipped directly to their front door. Looking for something a bit more traditional, perhaps a delivery from the local florist? We can do that as well as we offer floral arrangements that are already designed by the professionals and hand delivered to their front door by a local florist company. Either delivery is as easy as a click of your mouse, just look at the options available for the gift. Don’t forget we offer traditional gourmet Christmas gift baskets as well, Christmas gift baskets for the dog, Christmas gift baskets for the cat and even the very popular Christmas gift basket for the pet lover! If you’re kind of stumped on what to get that teenager who simply wants everything; satisfy their sweet tooth with something that you can afford. Send one of our candy bouquets like the Reindeer Reese’s! Maybe they are more of a cookie lover; we have really delicious Christmas cookie bouquets too! Each cookie is a meal in itself they are just that big! With each cookie coming individually wrapped, it’s easy to only eat one and save the others for later. Of course if you have to eat it all at once… we do have a colossal Jolly Saint Nick cookie that will take you a while to eat! We have holiday cookie bouquets for young families that have Santa and his reindeer (Santa Clause is Coming to Town cookie bouquet) to more formal and perfect on office desks like Winter Wishes Cookie Bouquet that comes in red and white snowflakes that can very easily be sent before or after the holidays as it’s themed winter. Looking to send those last minute corporate gifts? We design those as well. Outstanding individual corporate holiday gifts that say thank you, Merry Christmas and Happy Holidays. BisketBaskets.com also offers the very delicious Maple Ridge Farms gifts for corporate gifting to large multiples like employee gifts or large lists of people that you want to stay within a budget with. Bisket Baskets can offer you a wide selection of that “something perfect” for the remaining people on your holiday shopping list. You don’t need to get dressed up to go out, no need to brave the cold winter snows; just sit down at your computer and shop away, we’re open 24/7 and able to take your phone order until midnight EST. Wine lovers have discriminating tastes, so you need to be on top of your gifting game when finding the right present. To start out with, check out the Wine Christmas Gift Baskets at BisketBaskets.com. Filled with wine-themed gourmet treats of the highest quality, this basket is sure to please. All you have to add is just a nice bottle of wine and you’ve got a wonderful gift that any wine lover can enjoy. Whether it’s a quiet night in or an entertaining dinner party, the treats in these gift baskets can help your wine lover celebrate. For that person who just needs to slow down and chill, the only gift – short of a vacation – is a Spa Christmas Gift Basket from BisketBaskets.com. Filled with lotions and potions to pamper your loved one, these gift baskets are ideal for giving someone you love the care and attention he or she needs to relax and get that time needed to unwind. Choose from a variety of soothing scents to find the perfect fit. The holidays deserve to be celebrated with everyone in the family, including the furry members! If you have a pet lover in your life and you need to find the perfect gift, try any of the Pet and Owner Christmas Gift Baskets from BisketBaskets.com. Filled with goodies for both dog and owner, these gifts are must-haves for the holidays. Get yours today exclusively at BisketBaskets.com and give a gift that gets two paws up!